... the Famicom Disk System version of Ice Climber. Another reason I bought this version: The banana-yellow disk seen in the photo above. (One or two more photos of the game can be seen in my Flickr photostream.) Oh, and it was less than $10. Yay! I do love those yellow disks. I own a few of these disks (oddly without owning a Famicom Disk System) and totally love the design. 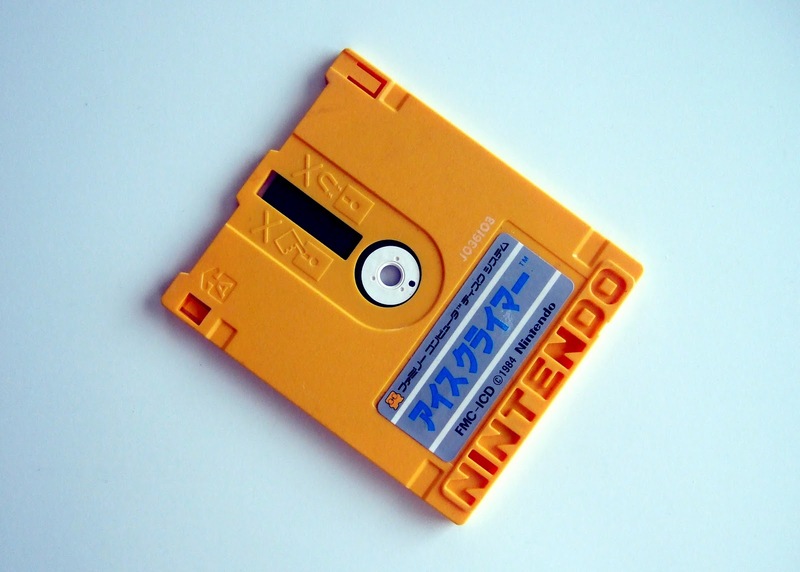 Something impressive about having these game in these small yellow disks and the engraved "Nintendo" on the bottom. Wish I had Ice Climber, though! Anyway, I agree with you that design-wise these disks are great. I'm always surprised by how small they are. Also, the "NINTENDO" part is great, as are many of the labels. One more thing, Mark: One thing you might find interesting about the FDS version of Ice Climber is that it wasn't sold in stores like most FDS games. It was only available through Nintendo's FDS kiosks that were available throughout Japan during the Famicom era. I think the FDS version of Clu Clu Land is in a similar boat. Anyway, if you like Ice Climber, you should track down the FDS version at some point (even via emulation), as this version is different enough to warrant attention, IMO. Yeah, I've seen pictures of those machines and even remember hearing about them as a kid and always wish they were in the states, but I didn't know about Ice Climber for Famicom only being avaliable like that. Does the Famicom Disk version feature the longer level music? I've emulated a few FDS games but none of the writable games! Gives me something to try tonight! Wow, I didn`t even know there was an FDS version of Ice Climber! Nice find! I agree about the yellow disks, they really look great. As for Ice Climber FDS having longer level MUSIC: I honestly don't know! For some dumb reason I've never paid enough attention to the music to know if the FDS version differs from the cart version in that way. I'll give it a listen shortly and let you know, OK? I have seen those Famicom CD soundtracks, by the way, but I've never listened to any of them. I always assumed they just contained straight-up tracks of the games. Didn't know they were remixed, etc! Sean: Yeah, I found out about this one a while ago, via Nindb.net, I think. Anyway, I've been looking for it for a while, mainly because of the ways it differs from the cart version. May have to track down the FDS version of Clu Clu Land eventually, too, for the same reason. Oh, there's no remixes, but there is a CD dedicated solely to the music and effects from the FDS kiosks. Plus they include two tracks from Ice Climber: the short famous one and a slightly longer one that ends with something that comes out of fifties rock. Ah, well, they still sound interesting, Mark! I think I'll have to check them out soon. BTW, does the one with the FDS tunes include the Ice Climber ones, too, or are they two separate CDs? It should be on two CD's. One is a mini-CD dedicated to music from Ice Climber and the first disc in a three-disc series on Famicom music. I wish I can find photos online.